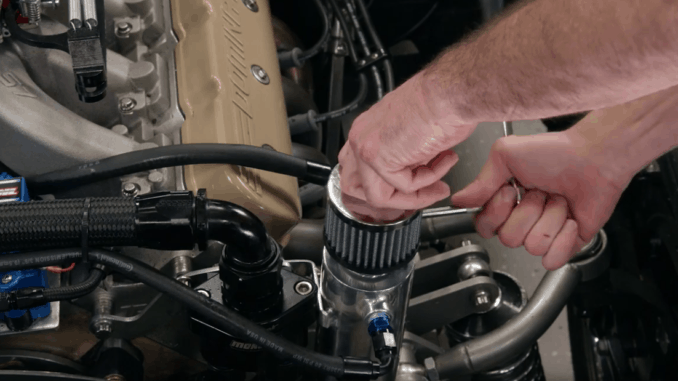 A catch can is designed with baffling on the inside to trap oil and vapor in the bottom side of the reservoir while still allowing the crankcase to breathe freely through a filter that’s on the top side. To make the connections to the catch can you can use a push on fitting. The first line attaches to the driver’s side valve cover vent and routes under the intake manifold and attaches to a Dash 6 fitting on the catch can. The passenger side line attaches to the vent tube, runs along the coolant hose and to the other fitting on the can. A breather attaches to the top of the catch can and is secured with a clamp.